Stocks in London are set to open lower on Friday amid weak investor sentiment after US President Donald Trump criticized the US Federal Reserve. The economic events calendar on Friday has Eurozone's current account figures at 12:00pm (UTC+3), and UK public sector borrowing numbers at 12:30pm (UTC+3). Don't expect any major move today or any unusual activity. 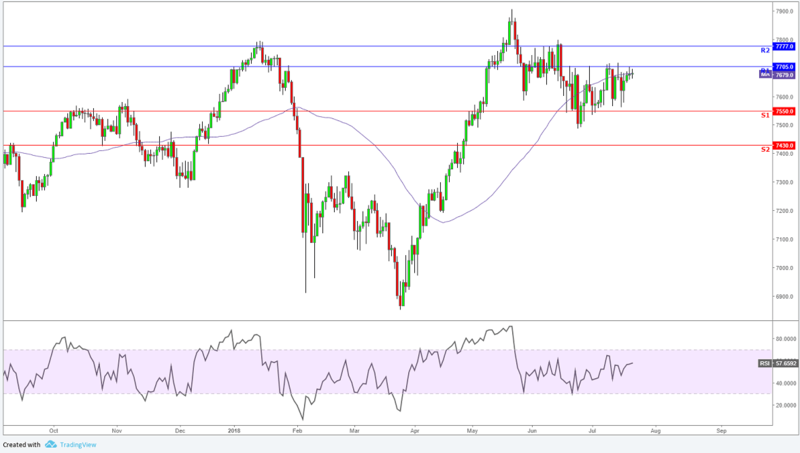 The FTSE100 is still trading between the 7550 and 7705 range since mid-June going back-and-forth with no clear direction. However, the US indices have been strong and this has kept the UK index strong as well. Although we are trading currently below the 50-day moving average and at the high end of the range, therefore expectations are to the downside as the markets take a rest and the bulls take some profits off the table.